This image, taken by NASA astronaut Randy Bresnik from the International Space Station on Aug. 26, 2017, shows the New York City area. On the 16th anniversary of 9/11, NASA shared a blog post providing look at some of the ways that the agency has participated in honoring those who died. NASA astronaut Frank Culbertson was the only living American who was not on Earth on Sept. 11, 2001. In a video interview from 2014, Culbertson reflected on what it was like being in space on that day. The NASA website also features images that Culbertson took from space of smoke and dust billowing up from lower Manhattan, where the Twin Towers were located, as well as other locations affected by the attacks. 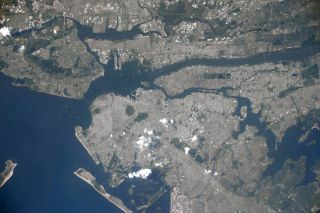 The post also includes images of New York City and Arlington, Virginia (the location of the Pentagon, which was also the subject of an attack), taken by astronauts on the space station in 2017. Visit NASA's website for more.